Cucumber could be believed as one of the oldest cultivated crops that agriculturists believe it must have originated from India. Cucumber which is a creepy plant has a light to dark green color, thin skin, moisture-rich flesh with tiny edible seeds inside, and is mostly enjoyed best in salads or fruit salad. It belongs to the Cucurbitaceous family together with watermelon and pumpkin. Cucumbers have been proven to be extremely beneficial for overall health, most especially during the hot weather since they are mostly made up of 90% water to keep the body hydrated and also contains important nutrients that are essential for the human body. Cucumber benefits range from preventing acidity to keeping skin well-toned.The flesh of cucumbers is rich in vitamin A, vitamin C, and folic acid while the hard skin is rich in fiber and a range of minerals including magnesium, molybdenum, and potassium. Also, cucumber contains silica, a trace mineral that contributes greatly to strengthening our connective tissues and muscles. 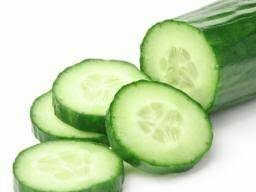 Cucumber’s high water content makes it naturally hydrating and this in turn gives a healthy skin. Also cucumber can be used to treat skin diseases like sunburn, eczema and psoriasis. I'm sure you don't know it could be also used to make a healthy hair growth. Now you know. Cucumber contains fiber and other nutrients which help regulates blood pressure and contributes to the proper structure of connective tissues in our body,muscles, bones, ligaments, cartilage, and tendons. Research has shown that cucumbers contain polyphenols called lignans (pinoresinol, lariciresinol, and secoisolariciresinol), which may help to lower your risk of breast, uterine, ovarian, and prostate cancers. Also, they contain phytonutrients called cucurbitacins, which also have anti-cancer properties. countless research has shown cucumbers contain potassium, which is associated with lower blood pressure levels. A proper balance of potassium both inside and outside your cells helps to achieve that. Every food item contains essential nutrients. The carbohydrates contribute in raising the glucose level, however, cucumber and it's nutrients can be easily digested by diabetic patients. Thus, consumption of this cool fruit keeps the glucose level in check. All Image here were gotten from Google. I liked your article on the cucumber! My husband grows them in our garden. We have a mold and insects in our area that love the leaves so he uses NEM oil on them. If you like some of my posts please feel free to resteem I will do the same. Wow Thanks for reading. You can please follow me for more of these article cos you seem to be a health enthusiast and Thanks for resteeming. You have quite nice articles on health and I've resteemed. Indeed a bonus. Thanks for reading. You may also love to read this one too. You can resteem too. I didn't even know these benefits that cucumber has, but it's always been my beat fruit. Please do. And thanks for reading. Wow!!!! Enlightening post about cucumber.... I heard cucumber helps in weight reduction too. Thank for your post my freind ..